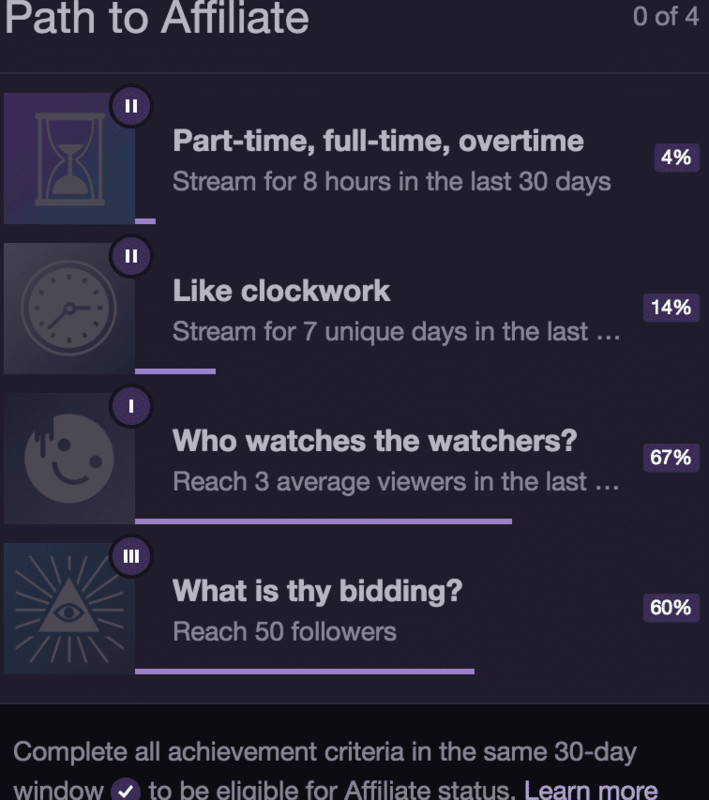 Streaming on Twitch is all about fun and games, but it’s also hard work if you want to live from it, and in the race of living as streamer, becoming a Twitch affiliate is the ultimate goal for many. Here I will give you some tips to accelerate your path. Why Become A Twitch Affiliate?? Did you know that one year after launching their Affiliate Program, Twitch has giving monetization opportunities to more than 220,000 creators!? The Twitch affiliate program is a great opportunity, especially for those part-time and new streamers, because it allows you to start earning money from subscriptions and advertising since the very beginning compared to a Twitch Partner and fulfill the requirements is feasible for any streamer. So, what are the requirements?? 7 unique stream days in the last 30 days. At least 8 hours streaming in the last 30 days. Average of 3 viewers or more over the last 30 days. Stream twice a week for the next 4 weeks, ex: Thursday & Saturday. Whichever days work for you, plan and stream consistently so your community knows when you’re LIVE. Put a schedule down below your stream. Easy enough! Stream at least 2 hours on your 2 streams per week and you will fulfill this by far. You will not have any kind of problem with this! Start promoting your channel on social media! Think on Twitter, Facebook, Discord, and find a community of streamers to expose yourself to others. Make sure to include your link when you introduce yourself so that people can easily click the link and hit that follow button on your channel. When you start a Twitch channel, it’s usually a good idea to let your friends and family know, invite them to come to watch and press the follow button to spread the word. Here’s the trickiest part that you might struggle as a new streamer, but it’s totally simple to achieve! You need to have at least 3 consistent viewers from the start and to the very end of your stream. Again, promote yourself on social media! Once you attract viewers, interact with them. Ask questions, how they are doing, if they like your content, make jokes, respond to chats, bring outside the best side of your personality, make them feel like part of your family, discuss funny things that are happening, you need to offer an entertaining time to them. Even ask your friends to help you meet this requirement. The key to success this regard is to let people know you’re streaming, and then be active with them while you’re on the stream. Play games that you like that are not dominated by Twitch’s top streamers, especially those with a big and loyal fan base and promote it on social media. Also, the multiplayer games can give you a plus because you can interact with your viewers and invite them to play with you. Join a community and network with other streamers in the games/genres you play, host them, play games with them, become friends with them (but don’t spam them). Keep streaming even when the month is over, don’t just do the minimum work. Remember consistency is the key to grow your channel continually. And last but not less, play games you enjoy! Best of luck to you and your channel!